Post save editors for Pokémon games here! Save files ("main", *.sav, *.dsv, *.dat, *.gci) GameCube Memory Card files (.raw, .bin) containing GC Pokémon savegames. Individual Pokémon entity files (.pk*) Mystery Gift files (.pgt, .pcd, .pgf, .wc*) including conversion to .pk* Importing teams from Decrypted 3DS Battle Videos Transferring from one generation to another, converting formats along the way. Data is displayed in a view which can be edited and saved. The interface can be translated with resource/external text files so that different languages can be supported. XYORAS Friend Safari and Mirage Island Tool! This tool works by adding the wanted Mirage Spots to the PSS Passerby data. Unlike standard daily mirage spots, players will not be able to access the hidden items. However with this tool, players will be able to reach Crescent Isle much easily, to encounter Cresselia. 3. Use this tool to set the ID of the islet you wanted. 4. Must remain as TID 00000 when soaring in the sky. 5. Land on the intend islet. PKHeX plugin to help making Mirage Island appear in Gen 3. Put the plugin into the plugins folder in your PKHeX directory, then access it from the Tools menu. 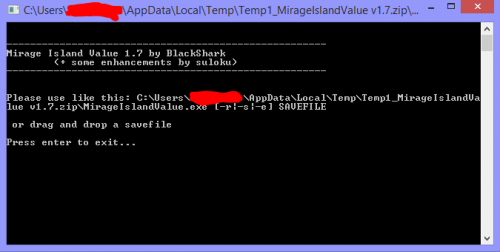 The seed has to match the last 4 digits of a Pokémons PID to make Mirage Island appear. 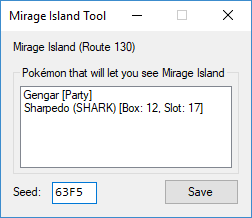 If a Pokemon was found that makes Mirage Island appear, you can select and right click it to view it. Ruby, Sapphire and Emerald are supported. Note: Win 10 might block DLL files downloaded from the internet. In that case right click the plugin file, go to properties and check "unblock" (as seen here). 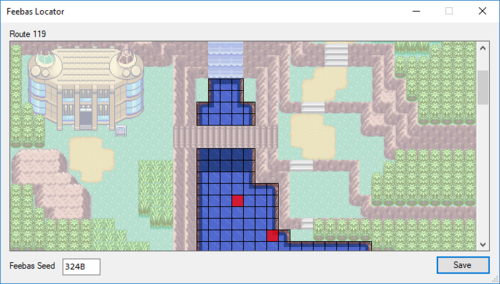 Description: This tool allows to see the Feebas fishing spot seed in a Pokemon Ruby/Sapphire or Emerald savegame. Description: For finding Mirage Island in RSE. Description: Allows dumping and injecting of Pokemon Link data for XYORAS. Description: As an example of what the aforementioned code library can do, this tool sorts your entire Gen 5 PC in National Dex order. Many people are playing custom Virtual Console versions of Pokemon Gold, Silver and Crystal. The saves of these games cannot be easily edited with PKHeX though, since PKHeX expects a different file size for Gen II saves. 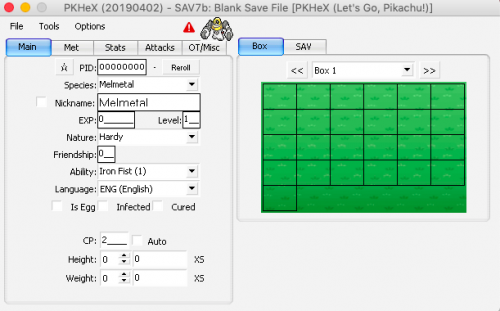 Direct support for these kind of files will surely be added by Kaphotics someday but in the meantime, you can use this converter right here to easily modify the size of your save file so that it can be used with PKHeX. It also works the other way around of course so that you can actually use your edited save files in your Virtual Console games. The usage is really simple: Just export your sav.dat file from the Virtual Console game using any available method, then drag the file onto sav_converter.exe. This will add a couple of additional bytes to end of the save file, afterwards you can just open it with PKHeX like you normally would. After you've finished your work with PKHeX, drag the sav.dat file onto the converter executable again to remove the additional bytes that were added before. Then you can simply import the file back into your game using any of the methods available for your specific 3DS setup. Due to the nature of the tool, I can't provide any screenshots, since there's just nothing to show, the program does not have a GUI. Its development has ceased. Users are highly encouraged to use PKHeX instead. For features that aren't in PKHeX yet consider looking for other tools first. Japanese Gen 3 - 5 save editing software. 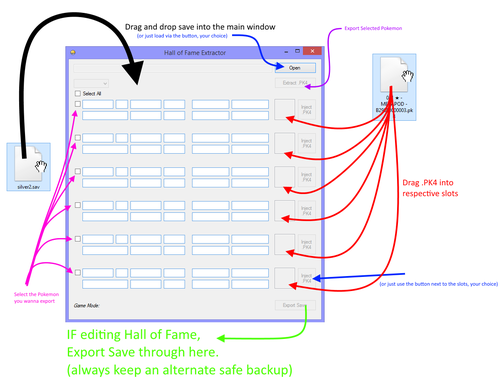 Basic Version for Hall of Fame Viewing and Extracting and Editing (via Injection). and always keep a safe backup of your saves, as a safeguard against unforeseen corruption. Note that Gen 3 info stored on the save is rather bare, compared to Gen 4 and Gen 5 entries. In any case, you gotta use PKHeX to fix all the legality problems (ball, location, IVs, moves, abilities etc). Use at your own risk. Purpose for adding this, is to aim to make it easier to revive possibly legal mons from the Hall of Fame. 1. Legends/Unown will directly use Method 1/Reverse Method 1 IV calculation based on PID. 3. For Gen 5 and onwards, in most scenarios PID and IVs are no longer linked. 1. Using the default loaded mon on a Hidden Grotto capture will likely cause it to be illegal. 5. Legends/Unown separate default loading has not been implemented for Gen 6. 6. In-game trades from Gen 4-6 have not yet been implemented. 7. In-game trades from Gen 3 have not been implemented in Gen 4-6. 9. Most Pokémon extracted in Gen 6 would probably be illegal, due to lack of Egg Moves. 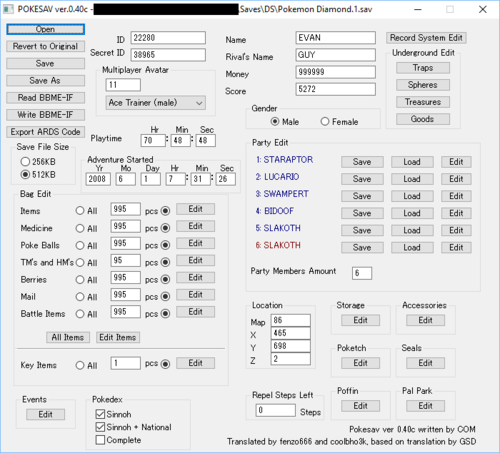 This is a save editor for pokémon Diamond, Pearl and Platinum that I translated from spanish a while back. Most of the pokémon editing is better done in PKHeX, but some features of this app are unique from what I have seen around. PKHeX plugin to find and edit Feebas fishing spots in Gen 3 and 4. Ruby, Sapphire and Emerald as well as Diamond, Pearl and Platinum are supported. Gen 4 is readonly for now though! TuxSH for his extensive research about Feebas fishing spots (RSE, DPPt). 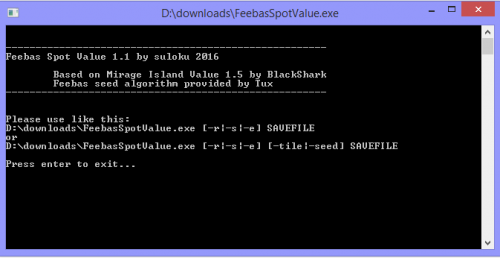 suloku for his Feebas Fishing Spot tool that has inspired me to make this plugin. As stated in my tutorial: I made these exe files using Advanced BAT to EXE Converter to be able to put the PKHeX icon onto the bat files. Nothing else has been done to these exe files and there are no viruses (I made this from scratch). This file also includes a standard bat file if you do not like having an icon or if you would like to make your own icon. 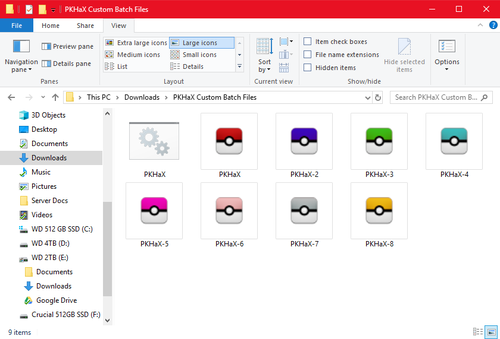 To use this launcher, simply put the launcher of choice in the same folder as PKHeX, then open the PKHaX launcher and PKHaX mode will be activated in a PKHeX window. Thanks to @Kaphotics and PKHeX for the Original Icon. I do not own these images, I simply modified the existing PKHeX icon. With that, this tool was born. theSLAYER and projectpokemon.org is not responsible if your save becomes unplayable. Always have extra save backups in safe locations! It basically imports the event flags for a save, right after the Photo Club event was done. It still requires PKHeX to fix the checksums of the save. 1. Load up a US or UM save that has progressed to right before the Alola Photo Club event. 2. Click on the "Standard Fix" button. 4. Save in PKHeX, and export the save from PKHeX. When save files are dumped incorrectly or corrupted in some way, they become unusable. PKHeX will not load save files of incorrect size (and also ignore files with such invalid/missing blocks). Standard Fix and Pokemon Box Salvage. Always keep backup copies of your saves, even the corrupted ones, before using any tool! 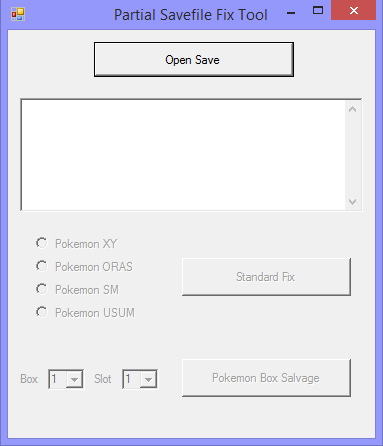 Pokésav is a save editing tool for Generation 4 (Diamond, Pearl, Platinum, HeartGold, SoulSilver). Its development has ceased. Users are encouraged to use PKHeX instead. 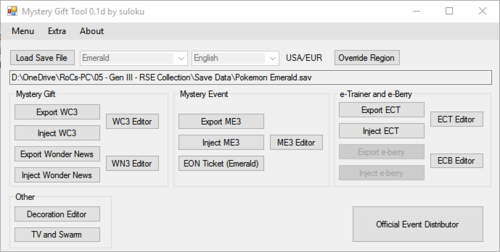 Pokésav does have a few key features that distinguish it from other things, such as Underground editing; if you don't need something specific, however, stick to PKHeX for gen 4 editing. This program was developed for those who wish to convert their save files offline, rather than having to go to the online one. Since the 20 may 2014, you can't any longer connect to the Nintendo Wi-Fi Connection with DS/Wii games like the Pokemon Series. 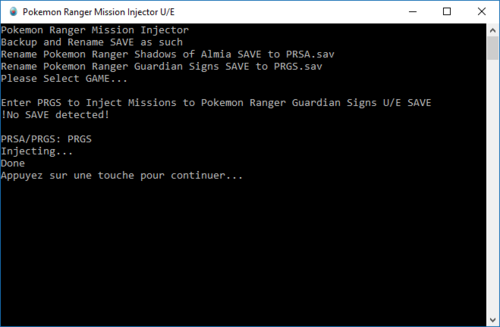 now you can inject the Pokemon Ranger's Wi-Fi Missions in a real cartridge. A big thank you to SciresM and Suloku for this very epic save editing software! This editor allows to modify current orbs (the that can be used to buy), refill clouds, items, upgrade levels and unlock the special gen IV extensions that can only be unlocked inserting the gen IV cartridges on the 3DS. Retrieval Extension: Obtain a total of 200 Dream Orbs Eureka Extension A (Tornadus): Obtain a total of 400 Dream Orbs Dowsing Extension: Obtain a total of 700 Dream Orbs, catch Tornadus Eureka Extension B (Thundurus): Obtain a total of 1500 Dream Orbs, catch Tornadus Eureka Extension G (Landorus): Obtain a total of 3000 Dream Orbs, catch Thundurus Press the "Give next reward" button to set it to a value that will trigger the next story event. Note: you may have to enter and exit the search screen each time to receive the all the rewards, since only one is given at a time. Kudos to Suloku for this epic app!